Whose offense will the Nittany Lions run in 2018? Is it still Joe Moorhead’s, who brought it from Fordham to a newly pass-Happy Valley and left it as a parting gift when he departed for Stark Vegas? 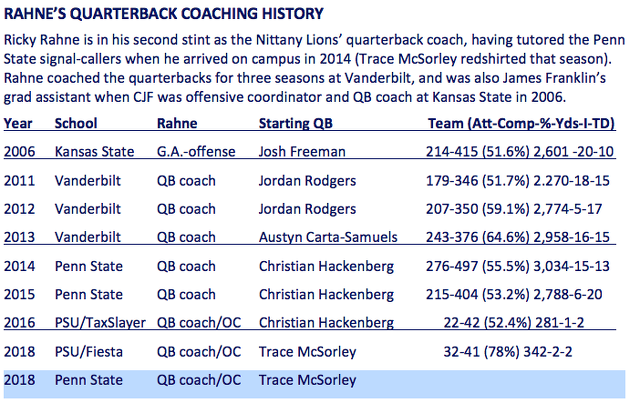 Or is it Trace McSorley’s, the triggerman who has run and passed for 8,040 yards and accounted for 75 touchdowns over the past two seasons? Is it James Franklin’s, who runs The Show and brought the RPO game to town when he hired Moorhead? Or, is it Ricky Rahne’s, the Nittany Lions’ new offensive coordinator and new (again) quarterbacks coach, who will be calling the plays from the press box in 2018? None of the above, says Ricky Redux. “I think it’s always going to be Penn State’s offense,” Rahne told me on Saturday. An even-keeled guy, Rahne also believes in a balanced offense. By at least one set of metrics in 2017, Moorhead was dead-on in that direction. Last season, the Nittany Lions ran the ball 451 times and passed it 458. It doesn’t get more balanced than that. Yardage-wise, Penn State’s run game last season accounted for 37% of the offense (2,212 yards), while the passing game produced 63% (3,772 yards). In 2016, the initial year of Moorhead’s — er, Penn State’s — offense, the breakdown was this: PSU ran the ball 58% of the time and passed it 42% (540 runs, 391 passes). Yardage-wise, 39.7% (2,406 yards) came on the ground, and 60.3% came through the air (3,650 yards). SC.com: How much will the offense change in 2018? SC.com: Are there some things that are signature Ricky Rahne? You said that in the first 21 plays in the Fiesta Bowl, nine players touched the ball. There were the shovel passes. Are there some things in this offense that are distinctly yours? Rahne: “No, no. I would hope not. I’m going to take what the defense gives us. “If there is one signature that I’d like to be known for it’s putting the players in the best position to succeed. That’s my main thing. I’ve learned that from being around a bunch of good coaches. That would be the one signature, I’d say. SC.com: Going back to your Cornell playing days, through your time coaching quarterbacks all the way back to Kansas State, what’s in your book — what are your basic offensive tenets for quarterback play? Rahne: “No. 1 is, Always be prepared. No. 2 is, Leadership is the key for a quarterback. My last thing in terms of a basic fundamental is balance. SC.com: What’s the No. 1 job of a quarterback? Matt McGloin once told me it was producing touchdowns. SC.com: Where are you going to be on game day? Rahne: “I’m going to be in the (press) box. One, you’re a little bit away from the emotions of the game. Two, I can see a little bit better. And quite frankly, I’ll have a table in front of me where I can be organized a little better. SC.com: The NCAA has reduced the number of headsets teams may use during a game (to 20; click here for the complete rule). How are you going to handle that?